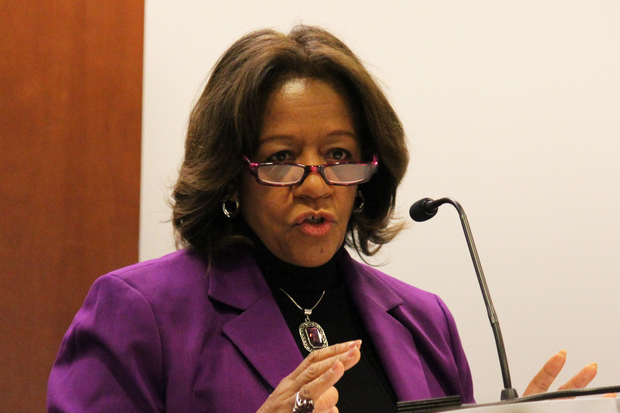 Barbara Byrd-Bennett, former chief of Chicago Public Schools, has been indicted. DOWNTOWN — Barbara Byrd-Bennett, the woman Rahm Emanuel tapped to lead the Chicago Public Schools following a bruising teachers strike in 2012, will plead guilty to corruption charges. Byrd-Bennett was indicted on charges she would receive money and benefits from firms she had previously worked for, the SUPES Academy and Synesi, in exchange for guiding no-bid contracts worth more than $23 million to them. "I have tuition to pay and casinos to visit. (:," Byrd-Bennett wrote in an email when talking about the plans, according to the indictment. Byrd-Bennett has been on leave since April amid the federal probe. At a news conference on Thursday, it was announced she is cooperating with the investigation and will plead guilty as soon as possible. U.S. Attorney Zachary Fardon speaks at a news conference announcing Barbara Byrd-Bennett's indictment and guilty plea Thursday. It was agreed that Byrd-Bennett, Emanuel's hand-picked schools CEO until she stepped down amid the federal investigation, would be paid 10 percent of the revenue of any contract awarded to the companies if she provided "sales services," according to indictment. 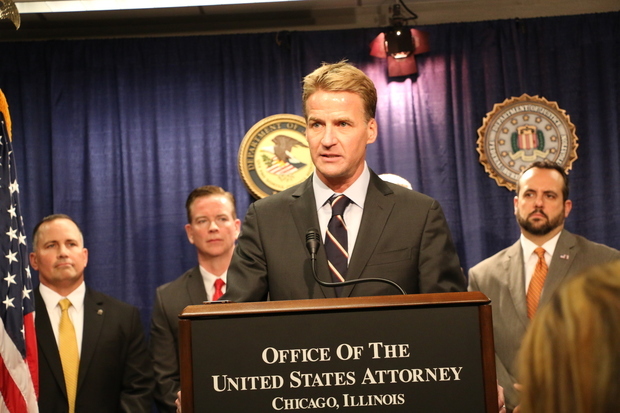 "We do have a long and sad history of public corruption in this state," said U.S. Attorney Zachary Fardon at the news conference. Fardon declined to explain the terms of a possible plea deal or answer questions about whether Byrd-Bennett would serve any jail time. Byrd-Bennett — who was paid $313,000 in salary and benefits — was provided with meals, an airplane ticket and seats at basketball and baseball games, according to a news release from the U.S. Attorney's Office. She also expected to be reimbursed by the companies for hosting a holiday party for CPS staff, according to the office. She introduced employees of the companies to CPS officials, gave the business owners information to give them an advantage over competitors and made it seem to CPS that she was no longer working with the companies, according to the indictment. Byrd-Bennett and people she worked with discussed the plans in emails, according to the indictment. Fardon did not say how investigators obtained those emails. "I think those emails reflect greed," Fardon said. "I think they reflect a public official who compromised her integrity and the integrity of her professional responsibility to line her pocket." Plans to "defraud and to obtain money and property from CPS" had started by April 2012, a month before Byrd-Bennett was named the chief of CPS, according to the indictment. The companies Byrd-Bennett worked with planned to conceal the kickbacks by funneling $127,000 each into two accounts under the names of Byrd-Bennett's relatives, according to the U.S. Attorney's Office. It was agreed that Byrd-Bennett would be paid the money promised to her as a "signing bonus" once she stopped working at CPS and was rehired at the companies as a consultant, according to the U.S. Attorney's Office. “When this stint at CPS is done and you are ready to re re re retire, we have your spot waiting for you,” Gary Solomon, former CEO of the SUPES Academy, wrote in an email to Byrd-Bennett, according to the indictment. Byrd-Bennett is charged with 15 counts of mail fraud and five counts of wire fraud. Ald. Amaya Pawar (47th) said in response to the news that Byrd-Bennett’s guilty plea is "devastating for our kids." “This is why people wanted an elected school board,” Pawar said. The charges against Byrd Bennett should be seen as an "indictment of the effort to privatize the Chicago Public Schools,” Pawar added. When profit becomes the motivation for governmental agencies that “opens the door to corruption,” he said. Wilmette-based SUPES Academy and Evanston-based Synesi have also been indicted, as have their former owners, Solomon and Thomas Vranas. Byrd-Bennett worked as a consultant for the companies before starting at CPS in May 2012. Vranas is charged with 15 counts of mail fraud, four counts of wire fraud, two counts of bribing a government official and one count of conspiracy to defraud the United States. Solomon faces the same charges, as well as an additional charge of wire fraud. The indictment wants Solomon, Vranas, SUPES and Synesi to forfeit an estimated $2 million in money and property related to the alleged violations. Solomon's attorneys, Anthony Masciopinto and Shelley Kulwin, said Solomon has "cooperated from day one" and they expect there to be a pre-trial resolution. "While he regrets his own errors, Mr. Solomon is disappointed in the breadth of the government's charges," Kulwin said at a Thursday news conference. The charges make it seem like the work of Solomon's company did not benefit CPS, but it did, Kulwin and Masciopinto said. They contend the charges "paint a picture that is overly broad as opposed to what went on." Mayor Rahm Emanuel said in a statement, "I am saddened and disappointed to learn about the criminal activity that led to today's indictment of Barbara Byrd-Bennett. Our students, parents, teachers and principals deserve better. Together, we have made significant educational strides at CPS with rising graduation rates, test scores and attendance and our commitment to building on that progress remains as strong as ever."